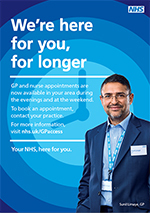 ensure ease of access for patients including all practice receptionists able to direct patients to the service and offer appointments to extended hours services on the same basis as appointments to non-extended hours services, and patients should be offered a choice of evening or weekend appointments on an equal footing to core hours appointments. The Improving Access to General Practice communications guide and resources are designed to support commissioners and general practice providers to meet this core requirement and inform and signpost patients to ways they can access general practice appointments. The guide includes practical advice on developing a range of communications activities, in addition to information on developing a communications plan, identifying local target audiences and other stakeholders. A variety of advertising templates accompany the guide, produced in a range of formats for use in print, web, email and social media communications. This includes posters, email/web banners and other display materials, which are available to download below. 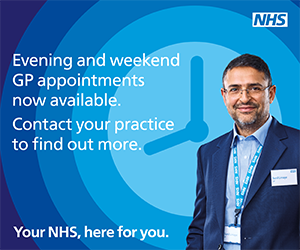 NHS England has launched a national campaign advertising the availability of evening and weekend appointments in general practice. 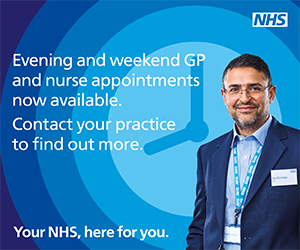 Patients across the country can now access appointments with a GP, nurse or other healthcare professional in the evenings and weekends either through a local GP access ‘hub’, their own practice or a practice nearby. The campaign will target working age adults through a range of national radio, print and social media advertising. Posters and other promotional materials are available to download from the Public Health England Campaign Resource Centre. Pull up banner artwork is also available. Please contact england.gpaccess@nhs.net to request this.